ok, so it's taken longer than i anticipated, but it's finally here; my review of Off-Road Disciplines by Earl Creps. i was interested in this book because of having heard the author speak before in various settings. what kept me reading past the first pages was the same "examine-your-life" thought provoking challenges intermixed with down-to-earth witty humor that i was used to in his speaking. what struck me most as an "X'er" associate pastor of a small town local church in the midst of change was something that wasn't explicitly stated in the book. the idea: "am i promoting 'churchianity' more than "Christianity". the book also gave me a fresh perspective on examining who i am, my motives for being in ministry, and the authenticity of my personal faith. i did find that portions of the book seemed to be written by two "different earls". on one hand, there's the coffee drinkin, blog writing, 'hip' earl that purposely hangs out with "X'ers" and can be found at the Mudhouse. this part of the book is easy to read, filled with witty humor, and real life stories of people practicing what he's trying to convey. on the other hand, there's the 'card carrying Boomer', seminary teaching, ministry experienced earl that has to purposely hang out with "X'ers" instead of fitting in naturally and can instead be found here. these parts of the book were very deep and insightful; but also 'heady', required more focused reading, and seemed to contain concepts written more towards people in ministry than the average Christian. that part may be more a fault of my own than one of the book. i approached the book as if it 'remixed version' of the 'on road' disciplines i had grown up learning. to me the'on road' disciplines (bible reading, prayer, journaling, simplicity, etc., etc.) were written more towards Christians in general (newly converted or not) as a means of deepening their personal Christian walk. 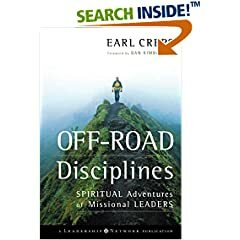 these 'off road' disciplines seem written more for ministry leaders as a challenge to rethink the motives and methods of ministering, both personally and as the 'Church', to people in today's culture. so all in all would i recommend the book?? an emphatic "YES!" not just for "boomer" ministry leaders, but for any believer (we're all called to be a ministers) wanting to be more effective, purposeful, and authentic in their ministry efforts. so go grab yourself a copy, read it with a teachable heart, and then go hang out with some of "the sought"!